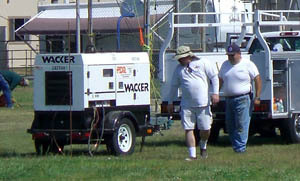 Dino-KX6D (L) and Robert-KG6WTQ checkout the set-up of the 20KW generator early Saturday morning. 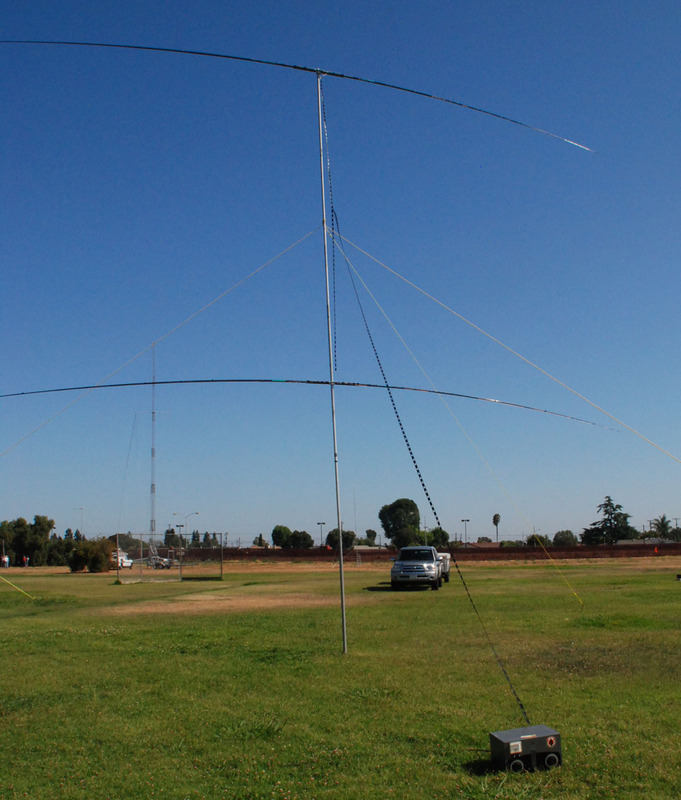 It ran quietly and flawlessly the entire Field Day. 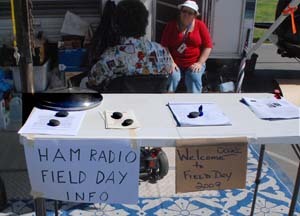 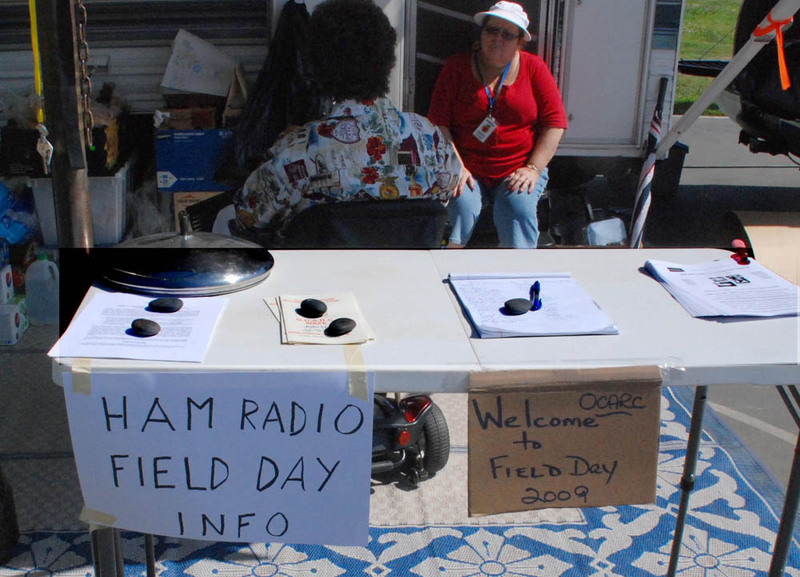 This was the FD Information Booth and sign-in area for Field Day. 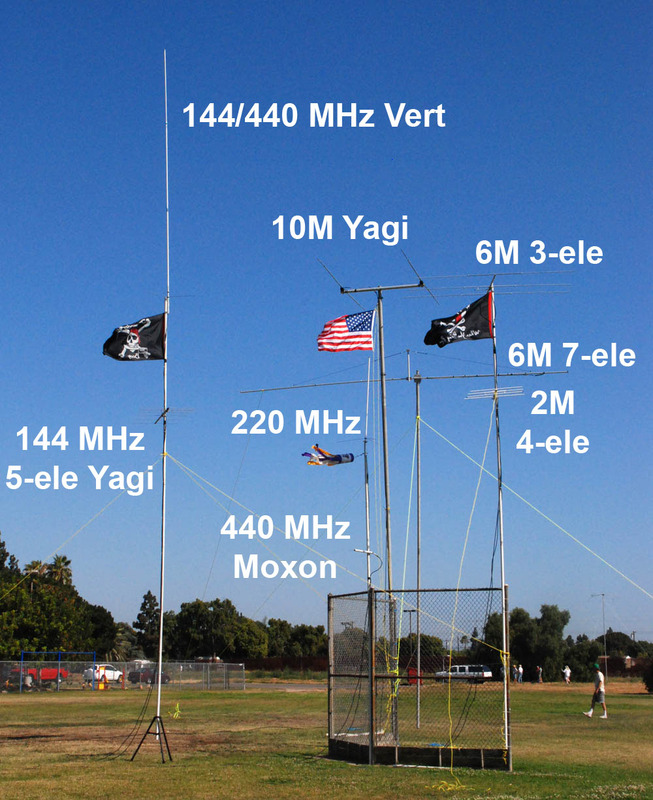 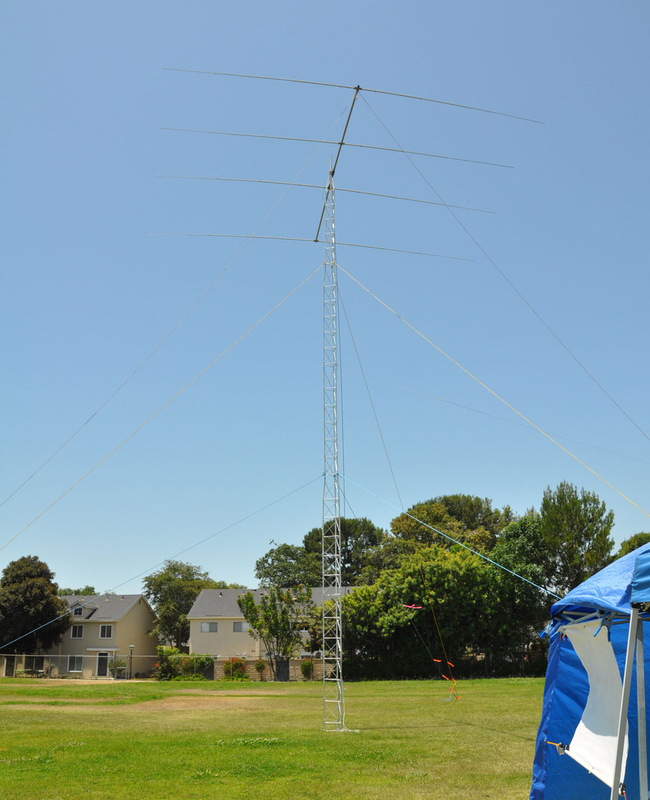 The high gain 6M 7-element Yagi was perfect for the E-Sporadic propagation that occurred during Field Day and racked up an amazing 387 contacts. Click on the picture above to see a high resolution photo. The 10M Phone station had a second 10M antenna fixed pointing up the Pacific Coast. 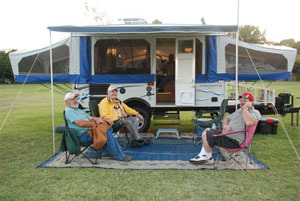 This is a "Double Extended-Zepp" that I call a "10M Zepp Curtain". 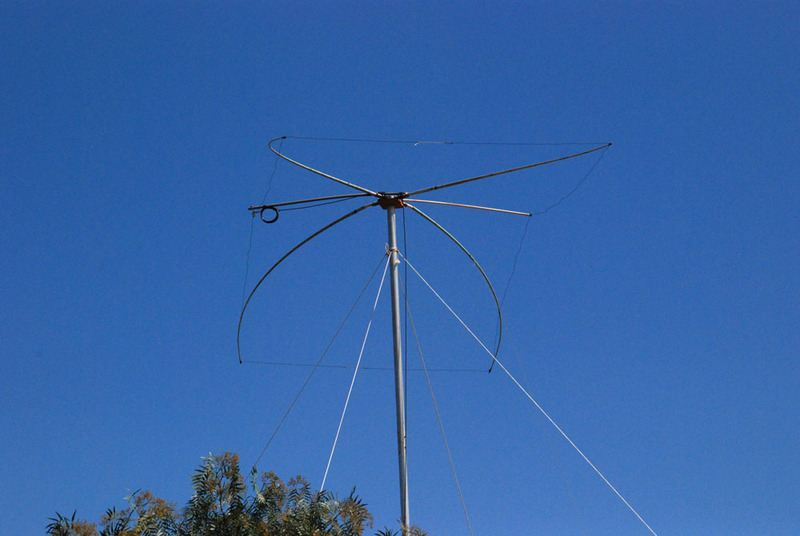 It was responsible for some of the 450 10M QSOs this year....mostly by Sporadic-E propagation. 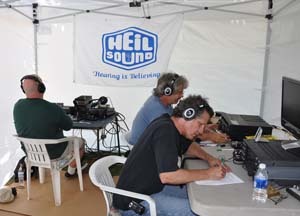 The box on the ground to the right is a classic Johnson Match-Box tuning the open feed line. 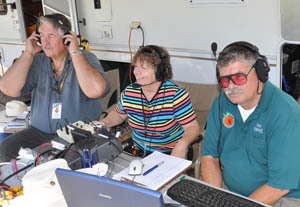 The Band Captain for the 15M/75M PH station was Cathy-K6VC taking her turn at the mike. 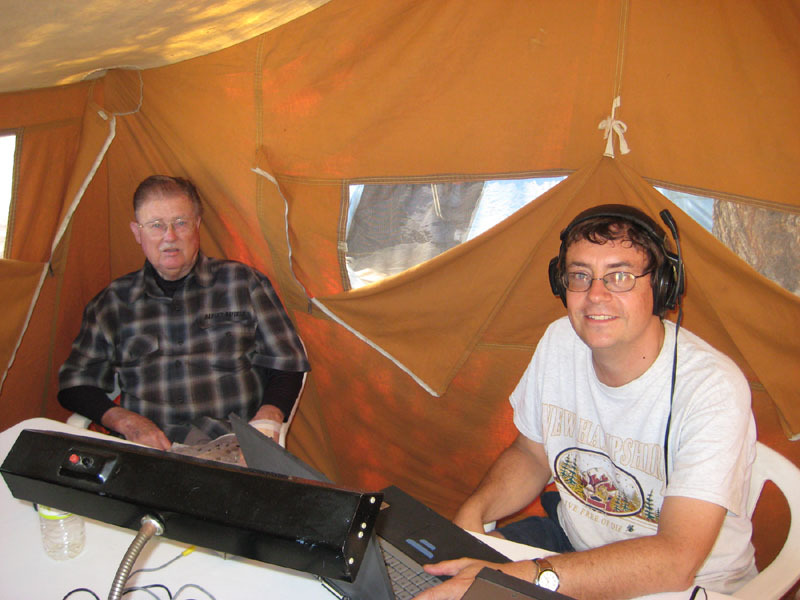 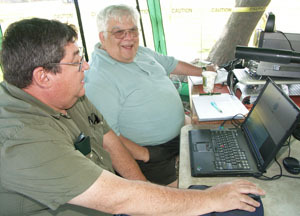 On the left is Hank-W6HTW (copying down incoming calls) and on left is Ken-W6HHC doing the logging. 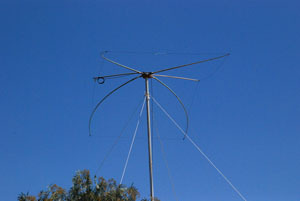 A shift-rotation in the 15M Phone operators. 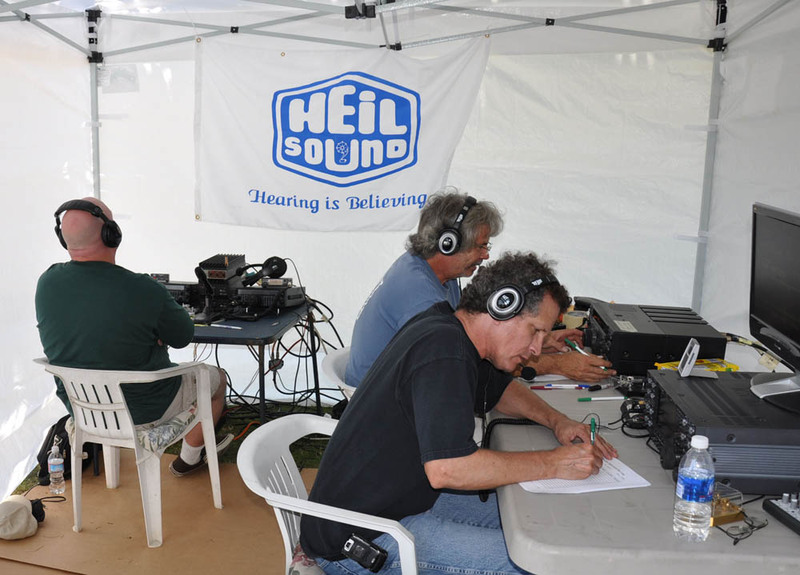 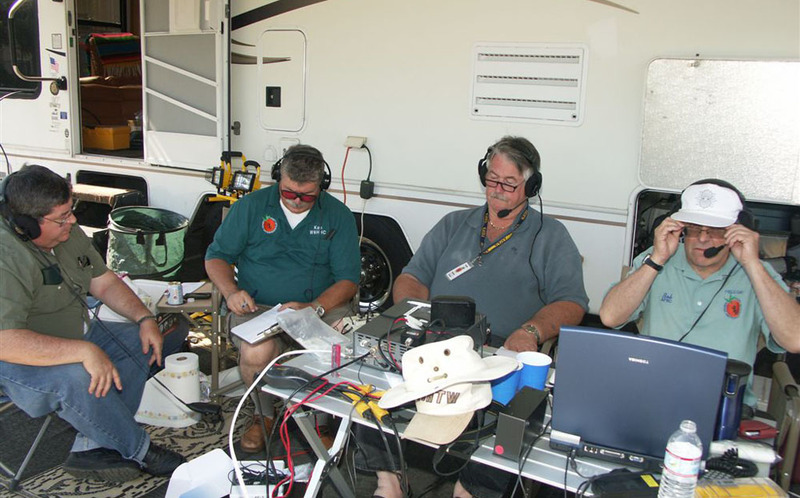 (L-R) Phil-KI6VEN, Ken-W6HHC writing down stations heard, Hank-W6HTW on the Mike, and Bob-AF6C logging. 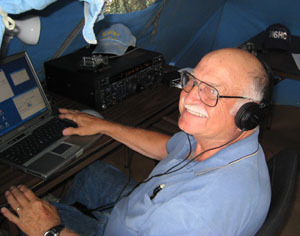 Later that evening Phil, relatively new to ham radio, ventured on to 15M as operator, after cutting his FD teeth on GOTA. 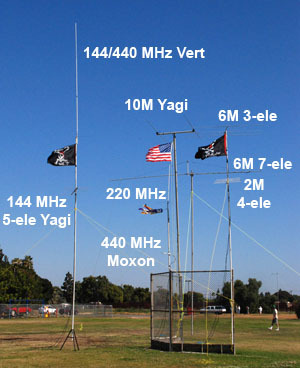 The 15M 2-ele beam is at the top of the pictures. 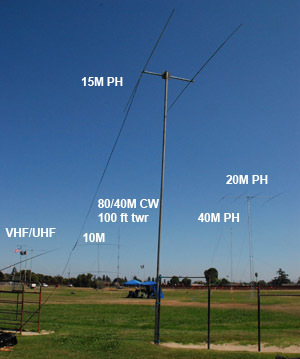 Other antennas in the photo are identified. 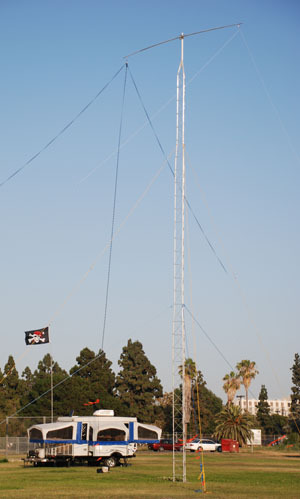 Click on the picture above to see the high resolution photo. The 20M PH station produced a terrific 970 QSOs on a band that had very few sunspots. 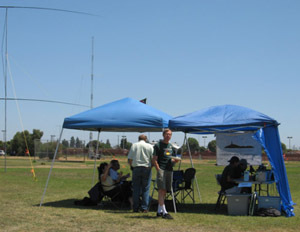 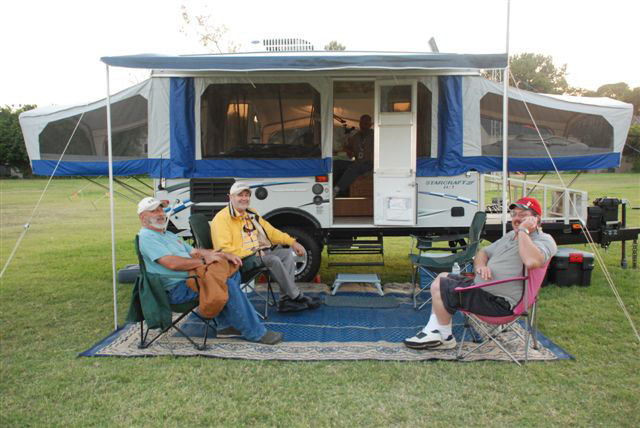 The open air 20M PH tent had a great breeze and plenty of shade for visitors to watch the pile-up wizards. The 20M PH station used a 4-element monobander beam to get great results. 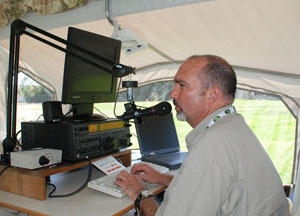 The GOTA station using PSK-31 Digital Mode. (L-R) new-comer to ham radio Phil-KI6VEN tries his hand a PSK-31 and FD for the first time while "GOTA-Master" Steve-N1AB shows him the ropes. 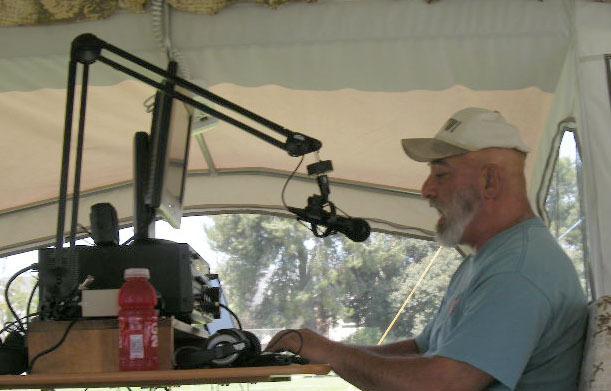 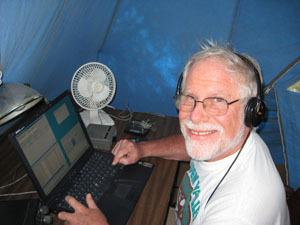 The Band Captain for 40M PH was Larry-K6YUI taking a turn at the pile-ups. 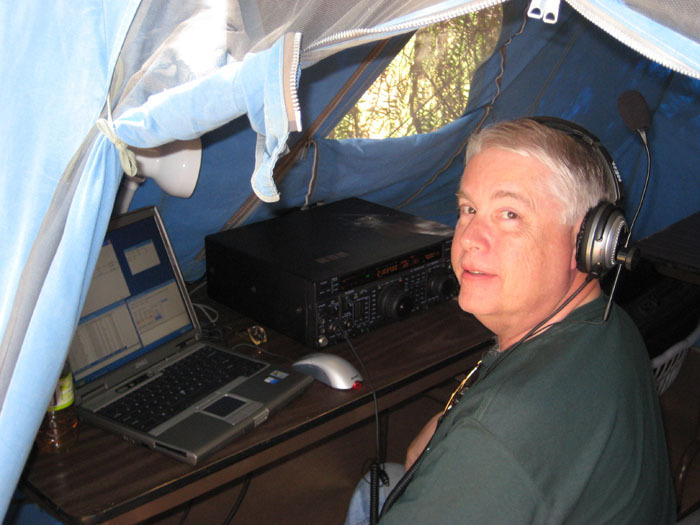 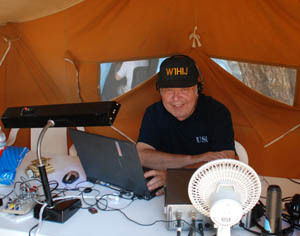 Doug-W6FKX takes at turn at running the busy 40M PH station.. 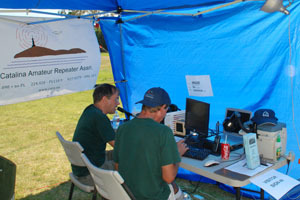 They gathered a total of 807 QSOs. 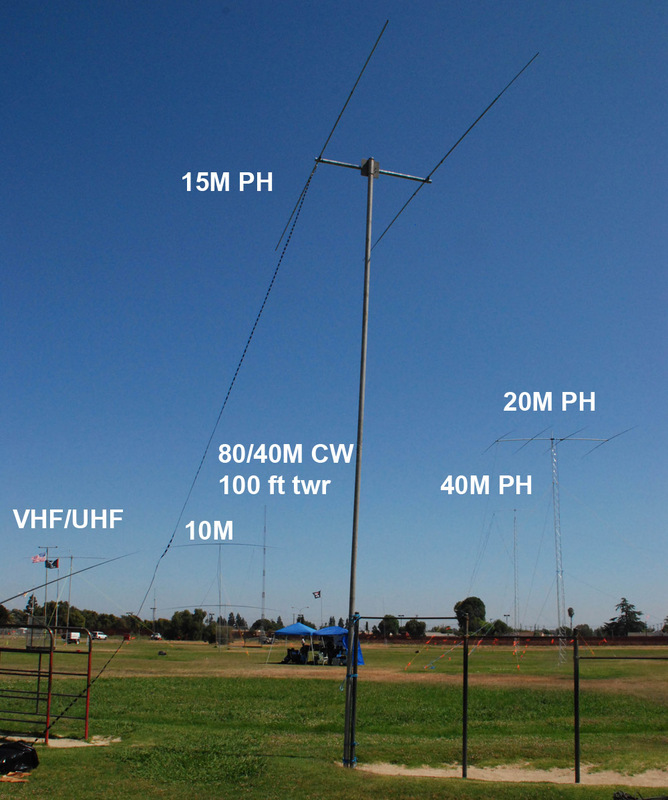 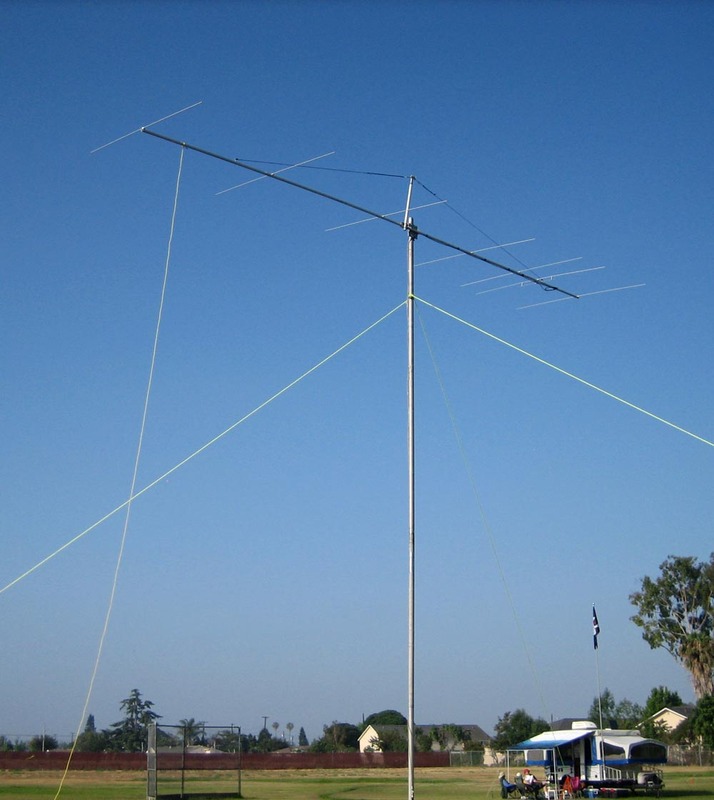 The 40M PH station used a 2-element 40M inverted-Vee beam on one the clubs 50-ft alunimum towers. 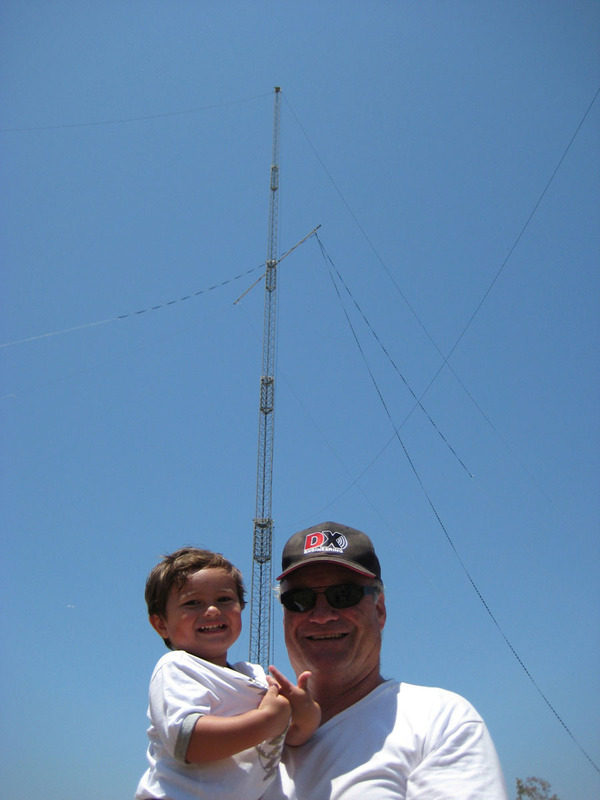 Bob-AA6PW is holding his young grandson, Caleb Medeiros, while standing in front of the self-standing 100-foot tower used on 40M CW and 80M CW. The 80M antenna at the 100 ft level is an Inverted-Bazooka antenna (dipole). The 40M 2-element inverted-Vee is at about the 80-ft level.